The principles of holography were discovered by Dennis Gabor in 1947. Its intensive development, however, began only in the early 1960s, after the invention of the laser. In 1962, US scientists E.N. Leith and J. Upatnieks modified Gabor's method and used the laser, which still remains the best instrument for recording holograms, to record and reconstruct a three-dimensional holographic image. 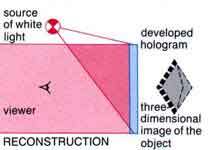 The term "holography" was formed from two Greek words, "holos", whole, and "graphein", to write, and means a method of complete recording of information about the light field of an object. 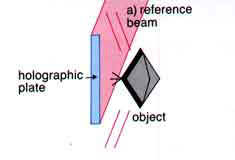 The essence of holographic recording is that a laser beam reflected from an object and carrying information both about the distribution of light intensity across the object and about the distance to its various points, referred to as an object beam, interacts with a "pure" reference laser beam, making a minute interference pattern, which is recorded on a high-resolution light-sensitive photographic material. 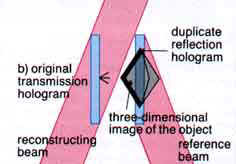 The hologram produced after developing the photographic plate is illuminated by a light beam falling in the same direction as the reference beam and, as a result of diffraction, a three-dimensional representation of the recorded object is reconstructed. Unlike photography, in which only the distribution of light intensity across an object is recorded on a plane and information about the distance to its points is lost, a hologram makes it possible to reconstruct the virtual image which is so faithful to the original object that it evokes in the viewer the desire to touch it with a hand. A substantial contribution to the development of holography was made by Soviet scientist Professor Yu.N. Denisyuk, who discovered in the early 1960s a method of recording deep reflection holograms visible in white light. Under the Denisyuk method, the laser is only used for recording a holographic image, whereas for reconstructing (viewing) it any directional source of white light such as sunlight, a slide projector or an incandescence lamp can be used (Fig. 1). At the recording stage, the object is illuminated by a laser beam through a transparent holographic plate. As a result of interaction of the laser beam reflected from the object and the light falling from the lens, an interference pattern comprising a complex set of numerous reflecting layers is recorded on the holographic plate. 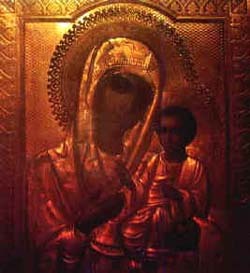 The developed hologram is illuminated by a source of white light and thus a three-dimensional image of the object is reconstructed. The possibility of using white light at the stage of reconstruction is determined by a high spectral discrimination of deep reflection holograms. Today holography is widely used in various fields of science and technology, but it is art holography, a field combining the efforts of scientists and artists, which is the most interesting area of its application close to art. 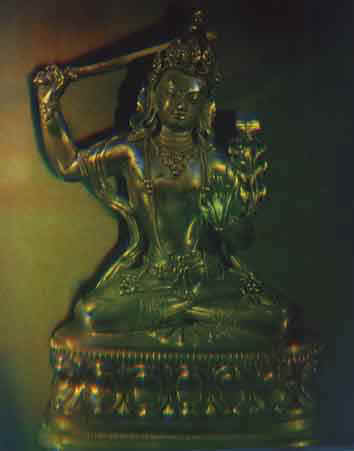 Since a hologram is, in essence, a full optical replica of a real-life object, this makes it possible to create excellent copies of unique museum pieces, original three-dimensional artistic compositions, holographic ornaments, etc. Thanks to their broad potentials, art holograms can be used in advertising various products, for they combine novelty and a full representation of the articles being advertised. 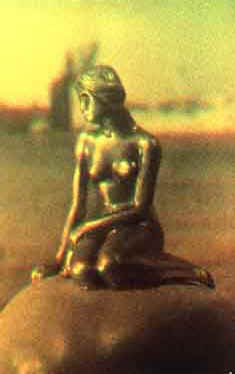 The development of Soviet art holography is based on the discovery of Professor Yu.N. Denisyuk and on an invention of Professor N.I. Kirillov, who has developed the PE-1 and PE-2 high-resolution transparent layers for the recording of high-quality reflection holograms,which are regarded by specialists as the world's best. The PFG-03 photographic plates using the PE-2 layers are produced in quantity and widely used in art holography. 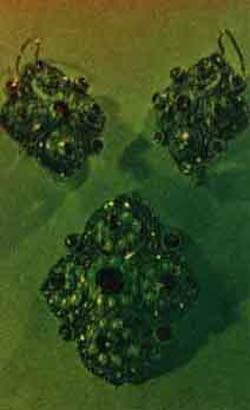 Laboratory castings of modified transparent emulsions of the PE-2 type are also used. 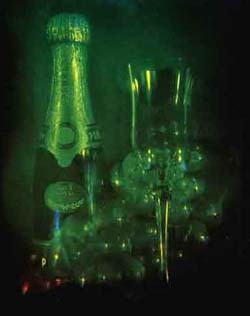 Besides silver-halogen emulsions, the PFG-04 photographic plates using bichromised gelatine -a phase material making it possible to obtain bright transparent holograms that can be viewed in diffused light when the holographic image has a shallow depth - are also used for recording art holograms. 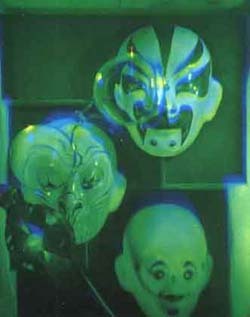 There are two organisations in the USSR, the Art Holography Laboratory of the Platan Scientific and Production Association (Studio OKO, head V. Vanin) and the Scientific Research Cine-Photo Institute (NIKFI), dealing with commercial holography. At the NIKFI, a team headed by I. Feldman is engaged in the work. The problems of art holography are being tackled by a number of organisations such as, in the first place, the State Optical Institute in Leningrad. Substantial practical work to record holograms of museum pieces using the Denisyuk method has been carried out at the Physics Institute of the Academy of Sciences of the Ukrainian SSR in Kiev. The NIKFI mostly produces large-size holograms (up to 1 metre) in small batches using the Denisyuk scheme or by duplicating original holograms recorded in accordance with that scheme. -two-angle (one hologram reconstructs two different images). The holograms come in the following sizes: 50x50 mm, 102x127 mm, 180x240 mm, 280x406 mm, and also 38 mm in diameter.